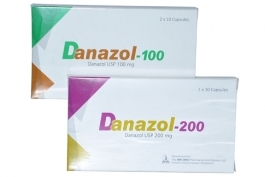 Danazol is a derivative of the synthetic steroid ethisterone that suppresses the production of gonadotropins and has some weak androgenic effects.It was approved by the US Food and Drug Administration (FDA) as the first drug to specifically treat endometriosis in the early 1970s. 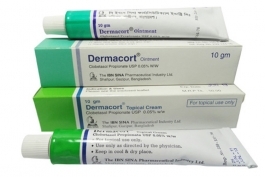 Dermacort is a preparation of Clobetasol. It is corticosteroid, preparation of Clobetasol propionate used for the treatment of various skin disease. It is available as 10 gm cream/ ointment. 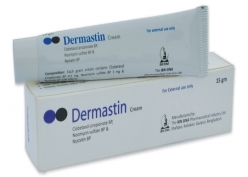 Dermastin cream and ointment are composed of Clobetasol Propionate BP 0.5 mg, Neomycin Sulfate BP 5 mg and Nystatin BP 1,00,000 IU. It is used for short courses treatment of recalcitrant eczemas, Neurodermatoses, Psoriasis (excluding widespread plaque psoriasis) where secondary bacterial infection or fungal infection is present, suspected or likely to occur. Clobetasol Propionate is a highly active corticosteroid with topical anti-inflammatory activity. The major effect of Clobetasol Propionate on skin is a non-specific anti-inflammatory response, partially due to vasoconstriction and decrease in collagen synthesis. Neomycin Sulfate is a broad spectrum antibiotic of the aminoglycoside type and is used to treat infections with bacteria. Nystatin is an antifungal medicine that kills fungi and yeasts by interfering with their cell membranes. The principle action of the preparation is based on the anti-inflammatory activity of the corticosteroid. The broad spectrum antibacterial and anti-candidal activity provided by the combination of Neomycin and Nystatin allow this effect to be utilized in the treatment of conditions which are or are likely to become infected. 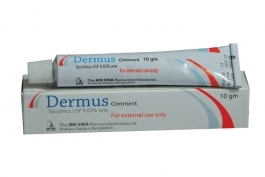 Dermus is a preparation of Tacrolimus. It is macrolide immunomodulator, is indicated for short-term and intermittent long-term therapy in the treatment of patients with moderate to severe atopic dermatitis. It is available as 5 gm & 10 gm ointment. Dexlan (Dexlansoprazole) is a proton pump inhibitor used to treat all grades of erosive esophagitis and Heart burn associated with non-erosive Gastroesophageal reflux disease (GERD). Available as 30 mg and 60 mg capsule. 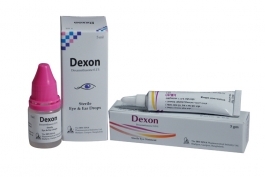 Dexon is a preparation of Dexamethasone. 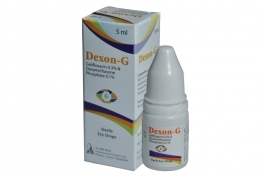 It is a synthetic long-acting glucocorticoid, used for the treatment of Various inflammatory and autoimmune diseases. 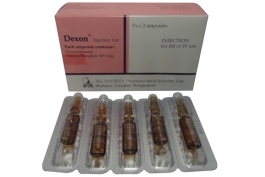 It is available as 1 ml injection. 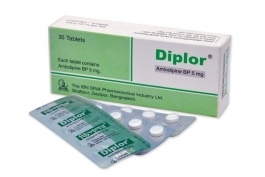 Diplor is a preparation of Amlodipine. It is a dihydropyridine calcium channel blocker which is used Hypertension, Chronic stable angina, Vasospastic angina (Prinzmetal's or Variant angina). It is available as Diplor-5mg and 10 mg tablet. 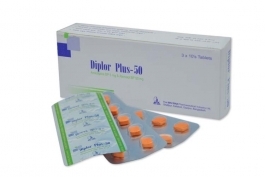 Diplor Plus is a fixed-dose combination of Amlodipine BP & Atenolol BP, used for Hypertension not controlled by monotherapy, hypertension and angina pectoris as co-existing disease, in post MI patients, refractory angina pectoris where nitrate therapy has failed. It is available as 25 mg and 50 mg tablet. 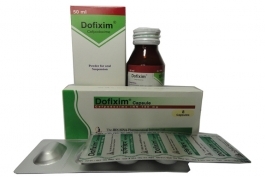 Dofixim is apreparation of Cefpodoxime. It is a broad spectrum, semisynthetic 3rd generation cephalosporin antibiotic, used for the treatment of infection caused bt bacteria. It is available as 100 mg capsule, 200 mg tablet and 50ml & 100 ml suspension. 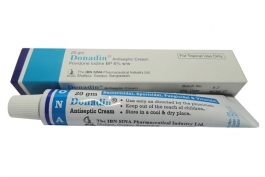 Donadin is a preparation of iodine and an organic polymer povidone. It is indicated for the treatment and prevention of infection due to cuts and abrasions, infected surgical incision and burns. It is available as 20 gm cream. 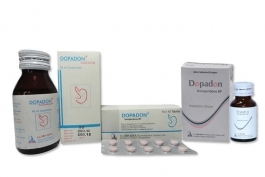 Dopadon is a preparation of Domperidone. It blocks the receptor binding activity of Dopamine. It is used in gastroesophageal disease, prevent nausea and vomiting. It is available as 10 mg tablet and 60 ml suspension. 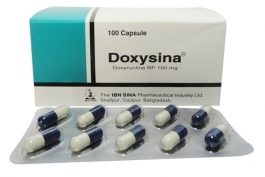 Doxysina is a preparation of Doxycycline. It is a broad spectrum antibiotic and is used in the treatment of a large number of infections caused by susceptible organisms. It is available as 100mg capsule.